With one of the easiest to use website builders on the market, Weebly offers an intuitive drag-and-drop builder that even the least experienced users can master in minutes. With the editor offering a more refined set of editable features, Weebly also has an App Center full of tools, elements and 3rd-party features that can be easily integrated with your site. Although professional and well-designed, the range of themes is somewhat limited- but Weebly is one of few website builders that allows you to import a 3rd-party-created theme as well as gain full access to edit your website’s entire HTML code. Weebly is therefore a fantastic option for both novice users with no coding experience as well as more advanced users who wish to further customize their site by adapting the code. With over 60 free themes, Weebly offers one of the more limited theme libraries (compared to major competitors such as Wix and Squarespace). But this shouldn’t be viewed as a negative. The simplicity of its theme library is one of many features indicating Weebly’s charm and appeal for keeping the website creation process as simple as possible. Weebly has certainly improved its design offerings in recent years, with all themes now mobile-responsive (yet no mobile preview is available). Themes are split into six categories: Online Store, Business, Portfolio, Personal, Event, and Blog. Although the themes are categorized according to business types, many of Weebly’s designs seem quite generic, meaning you may not find a theme that exactly matches your business needs. But this hurdle is overcome with the real benefit of Weebly’s themes- customization- you can change, add or remove all of the elements on the page and even edit the template’s HTML and CSS code! Whilst editing the code is best left to a user with development skills, it’s a real plus for users looking for an easy-to-use website builder that allows them to maintain some control of the design of their site. And the flexibility of Weebly’s themes doesn’t stop there: you can also change your theme whilst you edit your website, without losing the content you have already entered in the editor. Whilst there is no blank canvas option (you can’t build your site from scratch on Weebly’s platform), there is an option to import a theme to Weebly. So if you don’t like the themes offered by Weebly, you can purchase a theme from a third-party provider, such as Baamboo Studio or Mojo Marketplace. Upon selecting your theme, you will be prompted to select the source of your website’s domain name: either a weebly.com subdomain, a domain you already own or a new domain (we cover this further in the Domain section below). If you are not ready to select your domain name, you can click the X in the corner of the pop up and go straight to the editor (you will need to select a domain before publishing your site though). Build: This is where you edit your website. Basic: includes titles, text boxes, images, map, buttons, contact forms and more. You can also embed code to add custom HTML. Structure: add sections, dividers and spacer. Media: HD Video & Audio (premium plans), documents, YouTube, flash and additional files. eCommerce: add products or categories. More: add a search box (premium plan), social icons, RSVP form, survey and more. Installed Apps: apps to boost the site’s functionality, covered in more detail below. The beauty of Weebly’s editor is that it offers a ‘what you see is what you get’ interface. The elements menu is your main source for editing your site- there are no hidden elements that you will have to search for and for the one or two actions that take place in a different section (eg. changing text fonts)- navigation through the editor is quite user-friendly. To add an element to the page, click it, drag it, then drop it where you want it placed on the page (the editor will shift the content on the page to make the new element fit). When you select an element on the page, a mini edit box will pop up over the element, offering more options for editing. In the example below you can see the elements menu on the left and the image editor box that has popped up because an image was clicked on. Another plus for Weebly’s editor is that you can see the edits you make within the editor, you don’t need to preview your site to see how all the elements function (as is the case in Wix). However, one drawback of Weebly’s site builder is the lack of in-editor information and help buttons on or next to the editor’s elements. It’s quite obvious what the ‘text’ and ‘image’ elements are, but some users may not initially understand the purpose or functionality of all elements (such as a ‘section’ vs. a ‘spacer’), and without on-the-spot helpful information, users may have some trouble with basic edits on the site. TIP: Weebly’s newest editor element- ‘Section’- is the perfect tool for users who need some guidance with their page design. With a new ‘Section’, you can add a range of elements and select from a number of ‘Layouts’ options. The Section elements include an image gallery, team biographies, featured box, menu and contact section. Once you have selected the element you wish to use, Weebly suggests a number of layouts to choose from, taking the guesswork out of the design process. Pages: here you can manage basic settings for each page. When you first click on the ‘Pages’ menu, a list of your website’s pages will open in the left side menu (you can also add new pages). Once you click on a specific page, it will open some basic ‘per-page’ settings, such as header image options (yes, no), visibility options (set the page to private, public, password protected etc) and some SEO basics (title tag, meta description). In this section, you can make basic edits to the theme such as allowing content to fit the full width of the page, change the menu background (only between light and dark though- no range of colors to choose from) and more. If you decide you want to use a different theme altogether, you can access the theme gallery to select your new theme from this menu. Text fonts (titles, paragraph texts, captions, product elements, buttons and more) are also managed from the Theme section. This is one of few editing options that requires you to dig deeper to find, but it allows you to manage the font for every type of text on the site which is a handy option. TIP: Keep your use of multiple fonts to a minimum, otherwise you will need to spend a lot of time changing the font for each element type, one-by-one (there are approximately 15 types of texts that can be edited). And not to mention, using the same fonts across all pages of your site is important in terms of maintaining a consistent and fluid experience for your site’s users. At the bottom of the Theme menu you will find an ‘Edit HTML/CSS’ button, which offers access to edit the code of each page. You can also export your theme from this menu. Store: Manage your online store. Add store information (name, location, currency, product and category layouts and more) and contact details. Fill your store with products (details, images and prices) and categorize them. Set up payment options for your store. To accept credit card payments you can set up integration with stripe, Square (upgraded plan) or Authorize.Net (upgraded plan). PayPal integration is also available for upgraded plans. Set shipping conditions such as carriers, shipping rules and more. Set Tax rates and calculations. The Store section of the editor also includes helpful articles on general eCommerce principles, selling through Weebly and tips for running your online store. Note that to benefit from these features and successfully run your online store through Weebly, you will need to upgrade your plan. Users can run an online store with any upgraded plan but should note that the Starter and Pro plans include transaction fees that must be paid to Weebly, amongst other disadvantages. Apps: Here you can choose to add apps to your site to boost its functionality. These include social apps, apps to boost traffic and sales and more (see the Weebly App Center section for more information). Settings: Control your site’s basic settings. These settings include site title, site category, favicon, site password (if you want to password protect your site), facebook sharing and more. You can also manage site-wide SEO, site editors (admin access), create groups who can view private pages, control the apps you added to the editor and manage basic blog settings such as posts per page, sidebar, comments and more. Help: Takes you away from the editor and to the Help Center (see Support for more information). A gallery element can be dragged and dropped onto any page to create a simple image gallery. The gallery itself can be edited according to the number of columns you want, caption presentation and image spacing but the layout will remain the same (all images maintain the same shape and size- they can not be edited individually). In terms of designing a portfolio page, we felt quite limited given the lack of customizable options. If you wish to present a customized layout with certain images larger than others, you will have to insert each image one-by-one (quite a time consuming process). Images inserted one-by-one can also be linked individually to external pages and a unique Alt Text (useful for SEO purposes) can be set. On the bottom left of the editor you will find a ‘Post Options’ button. The Post Options section allows you to schedule posts, manage comments, add blog categories and edit basic SEO options such as post Title Tags and Meta Descriptions. There are also additional Blog options in the main Settings menu. These options include controlling the number of posts per page, social sharing buttons, commenting system (Facebook or Disqus) and more. Whilst the blog interface is very user-friendly, the customization options here are limited, so it is best suited to users who wish to publish new articles quickly and easily without the need for unique design and customization options. The extent to which we could customize the blog page. The background remains gray. 2 types: Title Text & Paragraph Text. As all of Weebly’s new themes are responsive, the editor doesn’t allow you to edit the mobile version of your site. You can switch the editor to a mobile view (from the top menu) but can not use the editor to change any elements. Although the mobile version of your site will display appropriately for mobile devices, there may be times you wish to change and replace content for mobile users. Given the importance of mobile websites for today’s businesses, we would hope Weebly will soon add a feature within the editor, allowing users to edit the mobile version of their site. TIP: If there are certain elements on a page you would like hidden for mobile users, you can purchase the ‘Hide if Mobile’ app to manage this exact task. The app- which costs $1.99- allows you to select the elements you wish to hide from the mobile version of a page and drag them into the ‘Hide if Mobile’ app’s box. By selecting the elements again you can choose the screen resolutions you wish to hide that element on (such as iPhone, Tablet etc). The app also presents a preview version of your mobile site with the selected elements hidden. We highly recommend purchasing this app to ensure you present your website’s users with a mobile-friendly experience. There are over 200 apps in the Weebly App center, categorized into 4 groups. Boost Traffic: Apps designed to boost traffic to your site through SEO tools that improve your search ranking. Spike Sales: Increase sales on your site with apps that help you collect reviews & testimonials, create coupons and promotions. Get Social: Integrate your social media accounts with your website: insert like and sharing buttons, stream social feeds and more. Free: implement form on one page only; up to 10 fields and includes branding of the app’s creator. Premium ($3.99/month): include up to 20 fields in your form, accept file uploads up to 5MB, remove branding. The X App allows you to customize your page’s layout beyond Weebly’s limits- use this top-rated app to create dynamic and structured layouts in a few quick clicks. 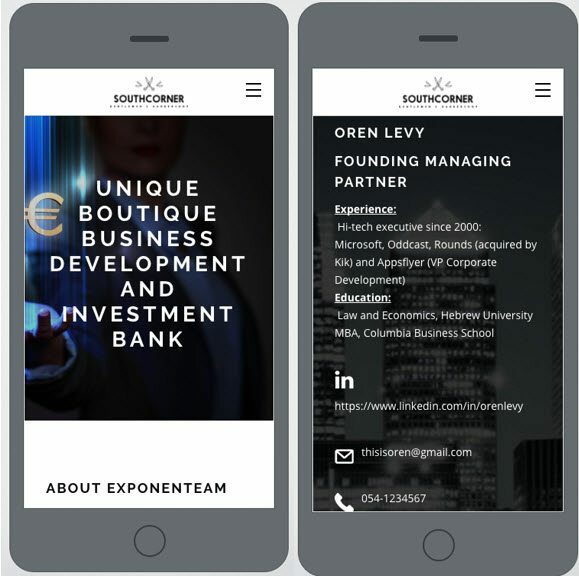 The app offers 75 animation effects for a richer site experience and allows you to create custom column structures that incorporate images, video (including video backgrounds) and text. The app costs $20 (one-time fee) and includes a 20-day money back guarantee. This mobile-optimized online booking tool enables you to receive online payments for bookings, send email confirmations, SMS reminders and marketing messages as well as take bookings from Facebook. Syncing all of your team’s calendar bookings, Appointedd offers the added bonus of its own mobile app so you can manage bookings on the go. Plans range from $12 (Standard) to $45 (Premium) to $60 (Superpowered) a month and include a 14-day free trial period. Although not found in the app center, we couldn’t pass on a chance to mention Weebly’s email marketing campaign management platform- Weebly Promote. Accessed via your home dashboard, Weebly Promote offers a complete email management system- you can create lead capture forms, manage your contacts and build email campaigns. There are approximately 20 modern and sleek email template designs to choose from, including a blank canvas (there is no integration that directly copies your website design – which could make the design process a little faster). The interface of the email campaign editor looks and feels the same as the website editor, making it easy to get started on customising your design. The features you can add to your emails are impressive: drag and drop the blog element to select which blog article you want to include in the email, drag and drop the products element to select the products you wish to display, add a coupon (need to set it up in Weebly Store), include your instagram feed, Google Maps and more. Whilst you can trial the platform with two free email campaigns, you will need to purchase a plan to continue using Weebly Promote. Starting at $8 a month, Weebly’s email marketing plans are slightly more expensive than competitors such as Wix, but do offer a number of great features as mentioned above. Site Meta Description (Note, Site Title Tag is set in General Settings). These act as the default Title Tag and Meta Descriptions for pages where a unique Title Tag and Meta Descriptions are not set. Header Code (Here you can insert Google Analytics, Google Search Console Code). Option to hide site from search engines. Page Title Tag and Meta Description. Hide chosen page from search engines. Weebly has also created a comprehensive guide to SEO which functions similarly to the Help Center but focuses solely on SEO tips and guides. It is a complete A-Z guide, split into four sections: Getting started (all the SEO basics- Title Tags, content, domain, links and more), Keyword Research, Growth, and Tracking. The Ultimate SEO Guide (as Weebly has named it) also includes a SEO checklist so you can keep track of the optimization work you have completed- a handy tool for users who aren’t sure what elements of their site should be optimized for search engines. Weebly Community: The community is run similarly to a forum for help whereby both Weebly staff and users answer other users’ queries. Email: Clicking the email button takes you to a dedicated page with a help form. Here you select the type of issue you need help with, provide your email address, describe your issue and upload a file (optional). Online Chat: When the staff are online, a chat button will appear at the bottom of the Help Center screen. They are available Mon-Fri 6am-6pm Pacific Time and Sat/Sun 8am-5pm PT. Direct phone number: The helpline is available to users who have upgraded to a Pro plan or higher. Use a Domain You Already Own: transfer or connect your domain to your Weebly site (done when you publish your site). The domain extensions .com, .net, .org, .co, .shop, .info, .us are free for 1 year when you upgrade your plan. Following the first year, the price of these domains starts at $19.95 per year (this is a little pricey given most hosting and domain name providers charge approximately $15 a year for a domain name). Transfer your domain name to Weebly (this can be achieved with .com, .net and .org domains only). This will allow you to update and manage your domain from within your Weebly account. Ask your domain name provider to point your domain’s A Records to Weebly’s IP address. With this option, you will continue to manage and renew your domain with the current domain name registrar (such as GoDaddy) whilst publishing your Weebly site to your domain. Note that you need to upgrade your plan to use this option. Instructions for both options can be found in the Weebly Help Center. All Weebly plans include free hosting. Weebly’s hosting service is cloud-based and offers unlimited storage for all plans. Up to 10 websites can be hosted on the one account and Weebly is one of the few platforms that allows you to export your site to another platform. 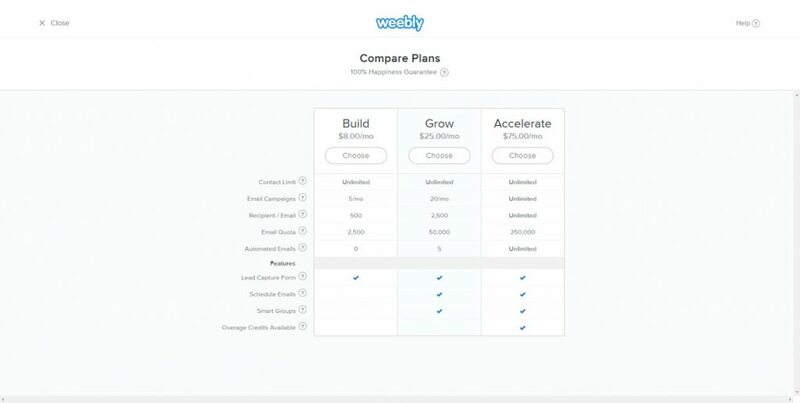 Weebly offers four core plans to select from, starting at $5.00/month for the Connect plan and ranging to $38.00/month for the Business Plus plan. A free plan is also available, however, we do not recommend this option as a free plan only includes 500MB of storage space, hosts your site on a Weebly.com subdomain (eg. mydomain.weebly.com) and displays Weebly ads on your website – which looks very unprofessional for a business website. Whilst Weebly’s plans are competitively priced, it should be noted that if you were to add apps from the Weebly App Center (as previously discussed) to enhance the functionality of your site, your monthly costs are likely to increase. There is chat apps available. Some only available on premium plan. You can change your theme whenever you want (the editor saves your content and presents it according to the new template). You can export your sites’ content and transfer it to another website-building platform. 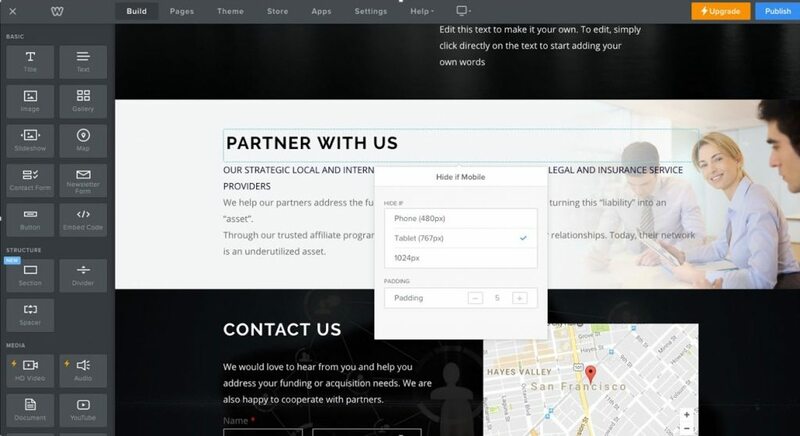 You (or your developer) can access and edit the HTML/CSS code to further customize your site. Whilst the above benefits certainly make Weebly an attractive platform, users should keep in mind that many of the apps that can be added to further customize your site, do come with a monthly price tag. And although Weebly does update its editor with new features, it is not done as often as its competitors such as Wix or Squarespace. Offering a simpler, easier to use editor than many other website builders, Weebly is a great option for fuss-free, drag-and-drop website building. Weebly’s platform is intuitive and many elements can be completely customized, even allowing you to import a 3rd-party theme. However, with a limited range of site-building features, Weebly lacks the added oomph offered by its leading competitors that feature more elements and integrations as standard. Have Experience With Weebly? Share it!